But the very first day at her new school, Suze realizes its not that easy. There's a ghost with revenge on her mind...and Suze happens to be in the way. The story behind how this novel got into my hands is pretty crazy lol. One of my favorite television shows is The Ghost Whisperer and i have always wished i could talk to and help out ghosts. Well, one day while watching a marathon of it i thought to myself "with all the amazing paranormal novels out there there HAS to be one about a mediator." So, i googled "books like the Ghost Whisperer" and yahoo answers told me that Meg Cabot's Mediator series was just like The Ghost Whisperer. I was definitely nervous to go out and buy these books, because in my mind Meg Cabot wrote The Princess Diaries and i can't move past that. I've never read The Princess Diaries, but i always picture it as for pre-teens (which could be completely wrong) and so i was worried to try it and get my hoped up. Then, when i went to buy it i couldn't find it. I scoured book stores looking for this book and the fact that i couldn't find it meant that i HAD to have it. Well, i finally found it! I actually read the whole thing in one sitting. It was completely captivating and i couldn't put it down. Now, i need to get all the rest of them and then try and convince Meg Cabot to write more of them =D haha. Shadowland is just like The Ghost Whisperer, or other way around since im pretty sure these were written before that show was ever thought of. I love Suze's badass attitude and that she isn't afraid of the ghosts. I was expecting her to be just finding out her gifts and scared, and then later being a badass, but it starts out with her knowing about them being completely ok with them. That was really refreshing for me. I am used to YA paranormals starting out with fear and confusion, and then understanding. I love every single character in this series. Her mom and step dad are awesome, her brothers are hilarious (especially Doc, he is so cute), her friends and awesome, and *sigh* Jesse. There are no words to describe how dreamy Jesse is. I am really excited where things will go with Jesse since he's a ghost. Shadowland definitely had me from page one, i was completely hooked. This story couldn't have gotten better and i am so excited to read the rest of the books! 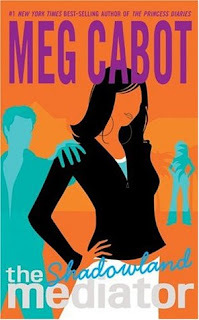 My view of Meg Cabot has also completely changed, because i've never been introduced to her writing style before and i LOVE it! Obviously she has to be good since she has wrote so many books and i think i will definitely be checking out more by her very, very soon.